Traditional homes are an integral part of our heritage. It is therefore pleasing to see the growing trend towards restoring older homes and the subsequent resurgence of interest in the house colours of our past. Many homeowners with older houses, especially those pre-1940 are striving for authenticity in colour repainting to enhance the true architectural heritage of their homes. In association with leading conservation architect Ian Bowman, Resene have developed a set of colour guidelines that reflect the various historical periods of home design. It is important to note that the range of colours used in the past was somewhat limited and changes between periods were gradual. Not every early homeowner may wish to recreate the exact colour shades of another era, but for those who do, this is an ideal starting point. The use of imported paints or homemade limewashes with one or two-toned colour schemes typified this period. Ochres, umbers, creams and fawns were widely used colours for limewashes on cob and earth buildings. The same range of paint colours, including light yellows, were common with domestic timber buildings that were designed to imitate stone. Although white was not common, it was used for window sashes on the simplest buildings. Corrugated steel roofs were either left unpainted or painted in dark reds. Natural roofing materials such as slates and shingles were not painted. Wallpaper was introduced towards the end of the period and became popular. White or coloured whitewash was common for smaller houses, while plain paint or wallpaper colours such as soft grey blues, Mid Green, crimsons, reds and lighter shades of these were popular, together with whites and creams. Timber ceilings, architraves and skirtings were varnished with kauri gum. The same earthy colours were used as in the earlier period but a darker range of tones was introduced. 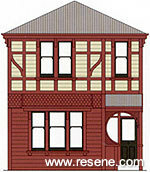 Weatherboard colours were Buff, Dark Buff or Drab, while trim, if picked out, was several shades darker. The sashes and doors were very dark reds, browns, greens or olive greens. Roofs were painted the same dark reds as in the earlier period but dark greens and greys were added. Striped veranda roofing was common with the darker colours alternating with creams. Inside, colours for all wall and ceiling surfaces and materials were carefully chosen to harmonise with each other, with common colours including crimsons, buffs, blues, greys, browns, reds, tans, olives, terracottas, greens, roses and golds. Usually architraves, skirtings, doors, window sashes and decorative timberwork were all varnished or, later in the period, doors, architraves and skirtings were black japanned. Painted plaster ceilings and decorations became popular towards the end of the century. The kitchen was likely to have had painted tongue and grooved match lining of whites and creams. The most commonly used dark colours remained the dark greens and reds and maroons with dark browns also used. Light colours were creams, fawns, drabs, dark pinks, buffs, pale greens and greys. Simpler homes retained the three colour palette with light weatherboards, dark trim and a different dark colour for the window sashes and doors. The alternative scheme used the same range of colours but the weatherboards could be a dark colour and the trim a light colour. 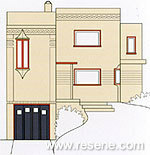 The complex, detailed styles usually picked out trim and framing elements. Veranda posts had brackets and mouldings of opposite colours to posts, finials were an opposite colour to their brackets, doors had the panels a lighter colour than the styles and rails, and gable framework was an opposite colour to the filigree detail between. The same colours were used on roofs as in the earlier period. Interior colour schemes were less bright with more colours used which were delicate and mounted. Colours included soft pinks, soft greens, light and dark grey, blues, yellows and detail sometimes picked out in gold. This period saw a greater range of style and use of colour than ever before. The Californian bungalow became the most popular style for housing, using pale colours such as off whites, buffs and creams for the body of the house and dark greens, dark reds and even blacks for trim and shingles under the gables and bay windows. An alternative was for the entire house to be painted or stained black. The Art Deco and Moderne styles from 1925 to the late 40s used paler colours such as off whites, pale greens, pale pinks, and light browns. Details were picked out, often in contrasting colours such as Mid Green and Melon Orange or Mid Green and Blue Night, Green Fields and Cobalt Blue. Window frames and sashes would be a light colour, while doors would often be a dark colour such as blue or green. Interior colours in this period were paler even than the previous period with pastels being common. A greater complexity of interior colour was introduced with stained glass and lead light windows. Since then, Ian has undertaken paint analysis on a great number of buildings and many of the buildings listed below have been analysed since the Colour Chart was produced. This has reinforced that the colours on the Chart, based more on academic research than practical discoveries, were accurate and authentic heritage colours. See a full list of the paint colours and an example of where they have been used in actual buildings. See the Resene Heritage colour chart for a range of heritage hues - order your copy online. Virtually paint your home with Resene Heritage colours with Resene EzyPaint virtual painting software. Resene EzyPaint virtual painting software allows you to electronically paint images using a wide range of Resene colours. It is available as a free download from this website. Download Resene EzyPaint. Get started with our colour scheme pages. View old Resene colour charts.